To build a link road connecting the A6 road to the east of Derry (from Belfast) to the A5 road to the south of Derry (from Strabane/Dublin). None as yet - please contact me if you have any to contribute. A scheme is in planning (as of June 2008) to upgrade the A6 road from Derry to Dungiven (part of the route to Belfast) to dual-carriageway. A similar scheme is in planning to dual the A5 road from Derry to the border at Aughnacloy (part of the route to Dublin). Half a ring road, in the form of the Crescent Link and Skeoge Link, runs round the north side of the city. The missing link in all these plans is a link from the A5 to the A6 round the south of Derry. Currently this movement requires drivers to drive right into the heart of the Waterside, the part of the city on the east bank of the River Foyle. In June 2008, DRD minister Conor Murphy commented in a press release on the A6 that "a further study will commence shortly to explore potential linkages from the A6 at Drumahoe to the A5 and will take account of the potential for improved linkages to the west". The results of this study were published in June 2010 and recommended that the link be built, but did note that the case on traffic volumes alone was not particularly strong. The route is obviously unknown at this stage, except that it would appear to connect to the A6 at Drumahoe which is further out of the city than the current Crescent Link. The western end would very likely be at Newbuildings, perhaps to the south of the town. The Google Earth screenshot below shows a possible start at the A6 at Drumahoe on the right and an end north of Newbuildings on the A5 on the left. 7 June 2010: Roads Service today released the Feasibility Study that was looking into the need for a link between the A5 and A6. The Study was actually completed in February, but has only now been made available to the public (It also contains two other road proposals, including a bridge over the Foyle at Newbuildings and a road round the west of the city). The study looked at typical journeys that are made betwen the two parts of the city, but it has to be said that the figures do not seem to suggest a strong need for this road. Of the 6100 vehicles coming north along the A5, only 2% goes on to the A6. Some of the further 35% who have destinations in the east of the city may also use the road, but this is just over 2000 vehicles per day. The case is much weaker for the 7400 vehicles entering Derry from the A6, of which only 6% might be expected to use the link road. It is very unlikely that traffic going from the A6 to the A2 Buncrana Road would use the link since there is already a mostly dualled route round the north of the city. In summary, the figures suggest that the link road may only attract a maximum of about 2500 of these vehicles per day away from the city centre. However, it also needs to be stated that this is not the only reason why the road might be built. Another reason would be to open up development land south of the city. The road would also have additional benefits and may attract more traffic away from the city centre if the proposed bridge over the Foyle at Newbuildings were to go ahead. 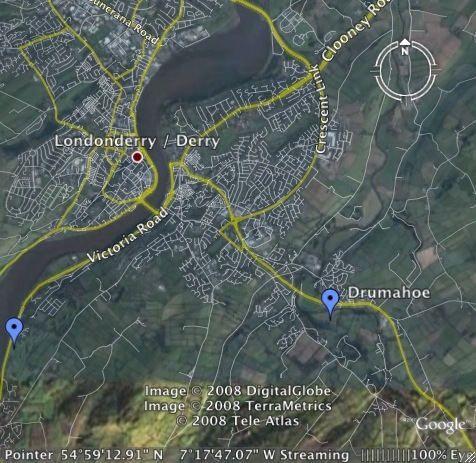 6 May 2010: A report in the Derry Journal in March seemed to suggest that plans are formulating for a link between the A5 and A6 around the south and east of the city and incorporating a third road bridge over the Foyle. It should be pointed out that the article does not contain any official comments by Roads Service, but it says that local politicians have met to discuss the proposals. The article says "It's understood plans for the bridge are at an early stage and that costings for the project have yet to be drawn up. The proposed road crossing is being designed to link up with the A5 road upgrade in order to improve the flow of traffic into Donegal and to ease congestion in the city centre." With work on the A5 upgrade due to begin within two years, and the A6 planned to follow a few years later, the need for this scheme may become more urgent as time passes. 23 July 2009: The preferred route for the A5 Western Transport Corridor (dual-carriageway from Derry to Aughnacloy) was published two days ago. In this, the Minister says that "[The upgraded A5] starts at the Derry end with a new single carriageway by-pass to the west of New Buildings. Immediately south of New Buildings there will be a roundabout which will be the start of the new dual carriageway. This roundabout will also facilitate possible future road links between the A5 and the A6 and also across the River Foyle to the west of the City and Donegal." This suggests that Roads Service are looking favourably on the idea of the A5-A6 link, and perhaps an extension westwards to the A2 Buncrana Road. All of this is strongly suggesting that the road (if approved) may run from south of Newbuildings to Drumahoe. Three weeks ago, the Minister also re-confirmed in a Written Answer to the Assembly that the report we are expecting on this topic will be released "later this summer". 23 Mar 2009: According to one of these Written Answers, the study into whether or not there is merit in building a road of this type is underway, with a report due in the summer. To quote the Minister for Regional Development: "Roads Service commissioned consultants in June 2008 to examine existing proposals, by Roads Service and the [Republic of Ireland's] National Roads Authority, to improve the primary road network approaching Derry and to consider how traffic, on these proposed roads, could best be distributed into and around the city. This commission has been extended to consider, as a priority, the feasibility of a link between the A6 and A5. This work will consider if such a link has merit and to make recommendations. A report is expected by summer 2009." 31 Aug 2008: A site visitor spoke to a Roads Service engineer off the record who commented that the study for this road proposal may include a third river crossing to the south of Derry and a possible link to the A2 Buncrana Road, effectively completing a city ring road. It should be stressed, of course, that this scheme is currently being explored for feasibiltiy and there is as yet NO plan to actually build it.